For relief, we now offer shipping to APO's and FPO's. What are they? 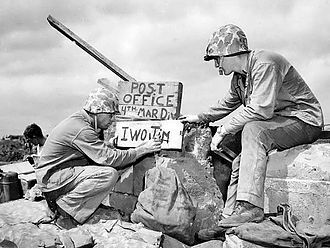 They stand for Army Post Office and Fleet Post Office (like the picture). So as far as I can tell it's a US address where we ship your stuff and from there the US military industrial complex takes it and forwards it to you the service member overseas that ordered it. It's a wonderful thing! So now, when you go to MotoTote.com and put items in the shopping cart, you can get a shipping quote by putting the APO or FPO info in the "Calculate Shipping" box. Select United States (even if you're in Japan for example), and in the State drop-down select either AA for Armed Forces Americas, AE for Armed Forces Europe, or AP for Armed Forces Pacific. The zip will be a US zip that corresponds to the overseas location. The shipping is not free because we are charged for the overseas leg of the transit but if your order is over $100 MotoTote.com discounts the by an amount equivalent to what it would cost for free shipping to customers in the US. If you've got time to kill and want to read further (MUCH further), just click here.